ILGA-Europe needs a dynamic person with strategic vision to lead their communications work, at a time when Europe is at a cross-roads. They have more than ever a need to develop strong narratives on equality, and to articulate a compelling vision of inclusive and diverse societies. By joining ILGA-Europe, you’ll have a unique opportunity to lead on developing a strong narrative, to set a progressive agenda for the next five years at European level. 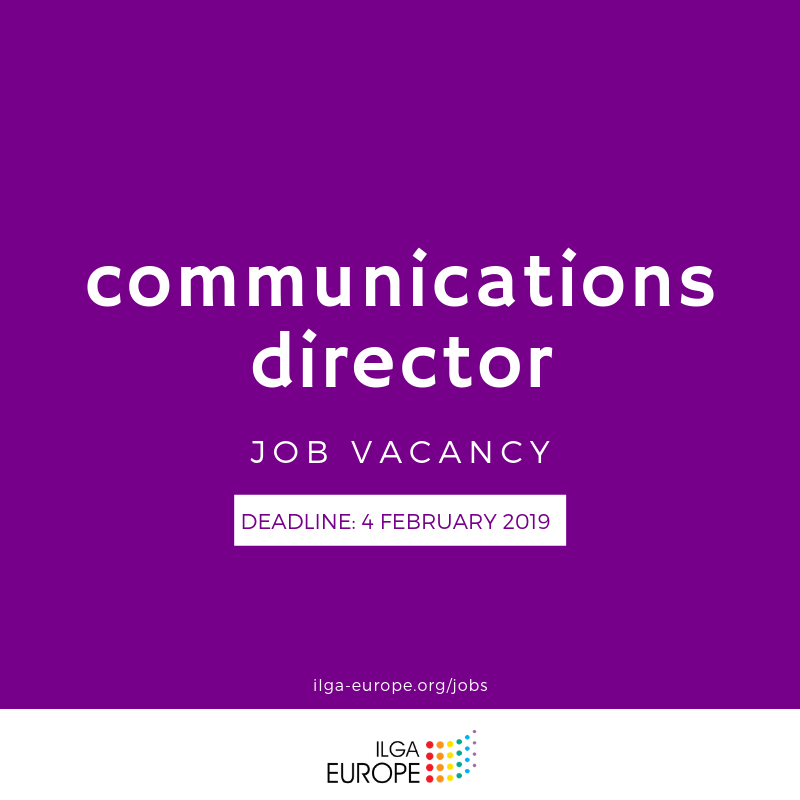 The Communications Director will be leading on the development and implementation of communications strategies that advance ILGA-Europe’s organisational goals and messages, and amplify ILGA-Europe’s advocacy, movement building, organisational development and fundraising work. The person will be expected to devise multi-channel communications strategies, including media and public relations, online and social media, communications with membership and campaigning, targeting a wide range of audiences – including key decision makers at European and national level, LGBTI and human rights activists and allies, the general public and new audiences (such private sector). Salary scale: Euros 64,441.27 to 69,713.73 in annual increments, starting at the beginning of the scale. The organisation has a generous remuneration package, including contributing to local transportation costs, luncheon vouchers, hospitalisation insurance, a pension scheme for employees, and ‘family friendly’ policies. Relocation support from within Europe to Brussels will be given where appropriate. ← Maspalomas Pride 2019: Wet & White Summer Edition!